Rey Maualuga, Cincinnati Bengals set to part ways? Published: Feb. 21, 2013 at 11:34 a.m. Updated: Feb. 21, 2013 at 01:54 p.m. Impending free-agent linebacker Rey Maualuga acknowledged after his poor performance in the season-ending playoff loss to the Houston Texans that the Cincinnati Bengals might not welcome him back. When coach Marvin Lewis recently outlined a plan to lock up the team's young stars, Maualuga's name was conspicuously absent. 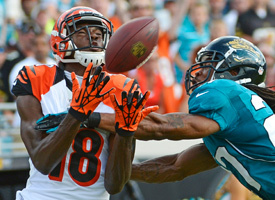 Check out the best photos from the Bengals' 2012 season. Citing a source with knowledge of the situation, Thesidelineview.com's Adam Caplan confirms the Bengals likely will take a pass on re-signing Maualuga. Although Maualuga played a career-high 1,025 snaps while starting all 16 games last season, he was burned for some big plays in the middle of the field. The Bengals have weakside linebacker Vontaze Burfict ready to move to the middle after exceeding expectations as a star rookie. Don't be surprised if Maualuga ends up with the AFC North rival Baltimore Ravens. General manager Ozzie Newsome and his staff reportedly had a high grade on Maualuga coming out of USC. There is an obvious need at inside linebacker with Ray Lewis retiring and Dannell Ellerbe scheduled to hit free agency.